That new show on The Learning Channel, Accidental Fortune is doing a segment on the Walton nickel and it's supposed to air on May 13th. We're pretty excited about it because hopefully it'll increase sales for our book Million Dollar Nickels. The episode finally aired Wednesday May 19th, and I had the opportunity to watch. The segment was brief, but nicely done. It's one of those reenactment shows. This one focuses on the stories of people who have stumbled across some item of value - I suppose the ideal storyline would be the 25-cent flea market purchase of an original copy of the Declaration of Independence. 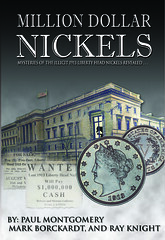 The 1913 Nickel story was just one segment in the hour-long episode. Other stories included an attic find of an original photo of the first professional U.S. baseball team, a rare original photograph by a famous nature photographer, and an old Victorian Rosewood piano in need of restoration. 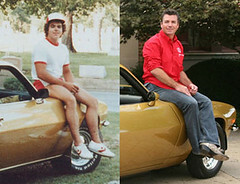 The lead story is one I'd heard about before - the search by Papa John's Pizza founder John Schnatter for his old 1971 Camero. After years of looking, an amateur antique car enthusiast turned out to have it and sold it to Schnatter for the advertised reward of $250,000. The prop coin was awful - it looked worn down and little like one of the real 1913 Nickels. But it was in a nice Capitol Plastics holder. Despite that minor problem I give the show high marks for presenting the story factually and entertainingly. They squeezed a lot into a short period of time - George Walton and his nickel, his death in a car crash, the declaration of the coin as a fake, it's storage in a Roanoake, VA closet for decades, the family's suspicion that it might be real after all (and their desire to "clear Uncle George's name"), the 2003 ANA convention, the publicity stunt "$10,000 reward", and ultimately the declaration that the coin is genuine after all, and likely worth $6M+. Whew. How DID they squeeze that all in? The episode said nothing about the creation of the nickels, another fascinating story, but that's why people should read the book. It's a great read and among my favorite numismatic books. Maybe someone could be convinced to make a TV movie based on it. Everything that was presented was very well done. I thought maybe the �6 to 10 million� dollar coin might have gotten a little more air time than the $60K photo or the $30K piano, but they were neat stories, too. 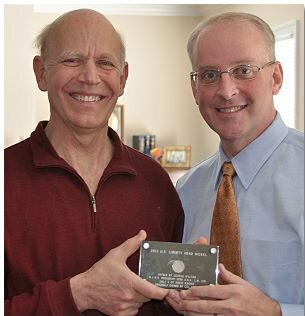 Above is a photo of George Walton's nephew Ryan Givens holding the prop coin with attorney Patrick Moore. For more background, see the CoinLink article below.